HILO, HAWAII — A group of barefoot children around 10 years of age wait patiently for one of the few actual classrooms at a South Hilo charter school to empty out so they can go into class. On a cement pathway they sit on simple white plastic buckets they have turned upside down to use as makeshift seats while sheltered from the drizzle. One dark-haired boy stands out because he is so small that his feet dangle inches above the ground and because his feet are covered — with socks but no shoes. Welcome to Ka Umeke Kaeo public charter school. If necessity is a key source of invention, this Hawaiian-immersion school, whose two campuses are located a 10-minute drive from downtown Hilo, may become a wellspring of creation. Ka Umeke has few permanent classrooms and many of the meeting and teaching spaces lack walls of any sort. Sometimes they are sheltered by nothing but a tent-like canopy. At stormy moments teachers put class on hold as students crowd into the few sheltered spaces to avoid getting drenched. 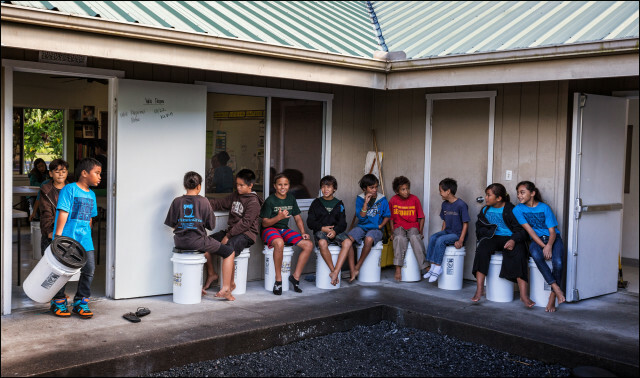 The school’s emphasis on Hawaiian-style innovation and resourcefulness suggests a whole other definition of a bucket list — all of the practical applications of a simple plastic pail. The students lug their multipurpose buckets — with a student’s name tag on each — around the ad-hoc campus. Children sit on them during courses, sometimes use them to hold their stuff instead of backpacks and put their bags to protection them from the rain. They also serve creative purposes, like drumming….